A pop-up toaster helps in toasting bread in a jiffy. It is fuss-free and helps to make toasted bread slices quickly. Just apply little butter, jam or sandwich spread and your delicious breakfast is ready! You can even cut them into cubes to make croutons which are far healthier than deep-fried croutons. Make soups like Cream Of Tomato Soup or Caesar Salad extra special with these crunchy toasted croutons. Baked Carrot and Spring Onion Open Toast and Pav Bhaji Toast are sumptuous and irresistible toasts. When had with a bowl of soup it makes a satiating mini meal. You can even make scrumptious sandwiches without griller or hand toaster. A dash of peppy chutneys, some vegetables and leafy greens will help you layer Veg Club Sandwich. If you are someone like me who has hummus stocked in their refrigerator, here is a recipe for delicious Toasted Hummus Sandwich with Vegetables. The Green Pea and Spring Onion Sandwich with a unique blend of the nuttiness of green peas, combined with the creamy mayonnaise, crunchy spring onions and tangy tomatoes are both a sumptuous and tasteful treat! 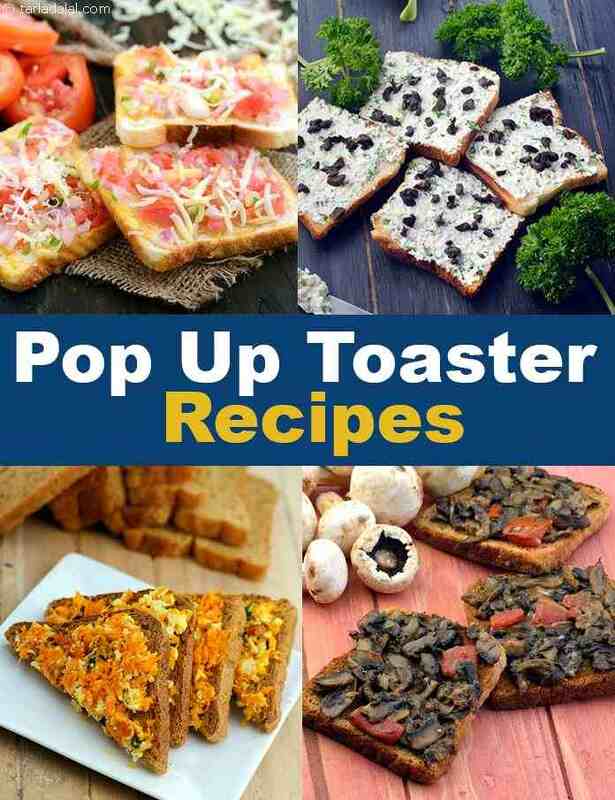 From healthy Masaledar Mixed Sprouts Sandwich to tongue-tickling Carrot and Cheese Fingers, explore our collection of incredible pop-up toaster recipes. Eggplant and zucchini go well together, whether in salads, curries or sandwiches. The toasted eggplant and zucchini sandwich makes use of the winning combo, enhanced with capsicum, garlic and mixed herbs. Use whole wheat bread for this sandwich as it goes well with the filling.